Have been reading a very extensive and well written article on Cernunnos, written by one Ceisiwr Serith. Very well written as far as my level of experience can tell. It also goes into a lot of aspects not normally mentioned or attributed to my new found Companion. What struck me as I read and took notes the other day was His “bi” nature, He walks in between the worlds. Between dark and light, wild and domestic,The Dead and The Living. It made me giggle and just about dance as I read along and the complexity of His nature revealed itself. Makes sense since I’ve always been a “border walker” myself. Hell, even my Ancestors were, literally. Last week I was talking with a friend who is a fellow Polytheist, and they explained how at one point in their Journey their Deity asked to be worshipped in a fashion that was very different from what they were used to. This conversation helped me realize the occurrence of The Virgin and the sudden need to study Catholicism and Jesus and such had a very interesting meaning. It’s a lesson really. One of My own making I suppose. For the past 15 years since I started this Journey I have always stated that “all Gods are One God”. The same Divine essence appearing in many forms so that whichever mortal happens to be contacted can relate and understand the Divine. I believe it is my time to actually put this into practice. Not to mention my time to finally get over my last but of PTSD regarding the Church and Christianity in general. It’s really not the faith itself I have issues with, it’s most of the practitioners. I also cannot give my child unbiased information if I don’t learn about the faith and get over and lingering unfriendliness. SO, time to put my money where my mouth is. That being said, I will be taking the RCIA (Roman Catholic Initiation for Adults) in September. Hopefully at the Polish Church. If that’s where we will be going for Mass then I would like to do it there. Will we register as parishioners? Who knows. Will I convert? HIGHLY unlikely. I can’t lie to a Holy Man for one. Two, I would much rather be baptised as a Pagan officially and get that on record. We will see what the future holds since TECHNICALLY I’m baptised as an Anglican at the moment and have never stepped into an Anglican Church in any Spiritual capacity. In my heart I am a Pagan Polythiest first, devoted to my Gods and Goddess’s and my Ancestors, Beloved Dead and the Spirits of the Land. I follow the Path laid before me though and who knows where it will lead. It’s always an adventure. As I mused over these thoughts on my way to Mass this morning I had this sudden thought bloom in my mind. I thought if Cernunnos and how He walks between the worlds, an intermediary of sorts. And then the thought of Jesus struck me…he was also an intermediary between the Divine and mortals. In some sense I believe that learning how to see MY God, Cernunnos in this aspect is part of the lesson. It made me smile and feel a lot more at ease about this whole thing. 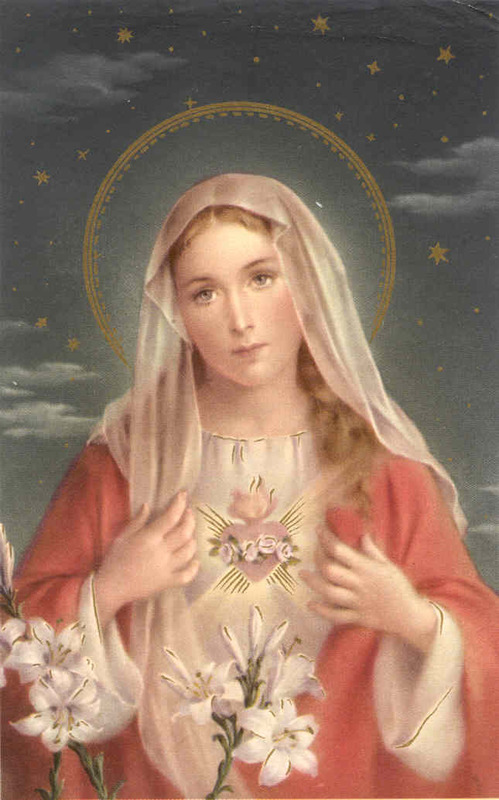 Mary is a comforting presence for me. A way for me to access a very peaceful and gentle aspect of the Mother. 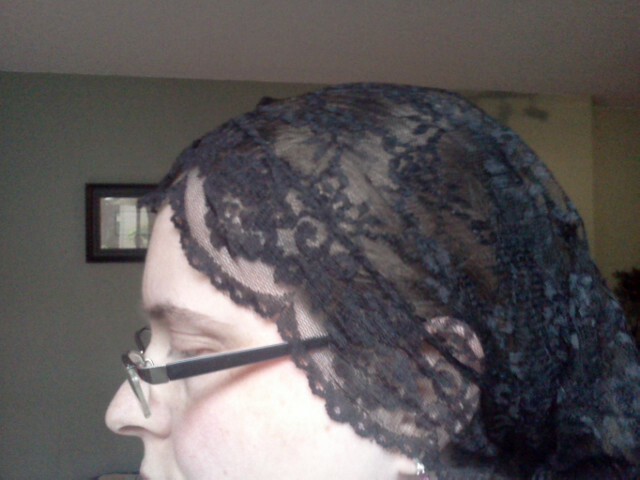 On Friday the Mantilla Chapel Veil that one of my Sisters in CiL sent me arrived. Beautiful black lace. I simply ADORE it. Feels much better then the smaller lacy black headband I was wearing. I can let this veil hang over my shoulders and small parts of my face. When I pray at my altar now I have a long rectangular white scarf that I wear, Marian style which feels very right. Having this black veil to wear to Mass makes me feel that much more comfortable and in tune with the Divine. She also sent along a white one that she wrote “CiL Sister” on with little red hearts. Made me super happy. That may become a almost daily one since the bandanna/babushka type covering seems to be what is wanted right now. I’ve been thinking of making a set of prayer beads to go along with The Song of Amergin. I adore that Song. I ADORE rosaries and always have. I already have one picked out that I am going to get. Well, two technically. Both with a Virgin medallion on them, one with beads made of rose petals, the other with beads of jasmine petals. A wee bit pricey though, so it won’t be happening anytime soon. Prayer beads in general are not strictly a Christian thing though. I’m sure they are MUCH older then that and I want a set that I can hold and think of my Deities in the forms that they appear to me usually, not as I am learning to see them at this moment in my Journey. I also find The Song of Amergin very…spiritual…it’s not just an invocation spoken by an Ancient Ancestor or part of the Invasion Myths. It’s almost Mantra like. Each line feeding into the next, reminding me of my connection to all things. It’s actually something I want to write down and take with me when I go into labour. Something I can focus on. I want the beads to be in a circle. I do want some sort of medallion on them. Or maybe a piece of antler or a feather. Something like that to mark the beginning. And amber, bone, wood…not sure what else yet. It is getting added to my list of projects though. Have also decided my Mary shrine will be in the living room, I’m going to get Rob to put up the little corner shelf for me above the general shrine and I will set it up there. Our Lady of Fatima seems to be the version of choice at the moment.